The only TLK pop I have is Scar. It's a shame that Rafiki (either of the two pops of him) didn't turn out any good, because I love the character. Cub Simba never looked too great either and this new one is a lazy variant (like the trident/crown Ursula). I'm waiting for them to make an adult version of Simba to buy. I might would get an Adult Nala, too--possibly. For some reason I put Moana on the backburner for so long, I ended up paying more for it. Stupid me. I only wanted to get one of her since she's a princess. I love Voyager Moana, but I went with regular Moana w/ Pua because it's the signature look for her. It'll be my only Moana pop unless they make Te Ka or Tala. I watched a couple of Magica de Spell eps of DuckTales this morning after the news she was being made into a pop. There's a new Tinkerbell pop (flying, like the new PP pop). I have the original, so will not be purchasing, but it does look nice. I'd say the wings in particular are an improvement. The Festival of Friends unboxing video is up on Funko's YouTube channel. It also includes a Pop of Pluto! So happy I got this box. They really need to update the molds for the classic characters though. The surprise pop is going to stick out like a sore thumb against their dated designs. Agree! The Kingdom Hearts versions of them are leaps and bounds better than the original releases. Kinda disappointed that Tinkerbell is the next box's Pop. Two Peter Pan characters in the first three boxes seems like a bit much. It gives me a reason to buy the new Peter Pan though. It is a huge improvement on the old Pop, but I had such high hopes for the Tiny Town box. The Rescuers and The Great Mouse Detective both spring to mind immediately when I think of films with tiny characters that have yet to be released as Pops. A lot of forum/reddit members are speculating that this box could be where we see the Orange Bird pop that had its prototype leaked to the internet a few months ago. Having no familiarity with the character outside of what I read on its wikipedia page I don't really see the connection other than it being a small character. I really don't see them putting Parks Character pops in the boxes to be honest as they don't have the same appeal as film characters to the masses. I could be wrong, but if I do end up with an Orange Bird pop in August it will likely be sold or traded. I'm going to make some bold predictions for the next 4 boxes. August: Tiny Town. I think Tink will be the only Pop this time around. I expect two Pint Size Heroes (Bernard and Miss Bianca will be my official guess) will be included and either another Dorbz figure or a Disney Plush. The PSH will be in the collector's tin this time instead of a Mystery Mini. October: Haunted Mansion. A new pose for Jack Skellington will be used to market this box. I think this box will feature a second Pop... The Halloween Town Mickey Mouse from Kingdom Hearts to go along with the leaked Goofy and Donald. I also think we will get 1 of 4 Mystery Minis featuring the Haunted Mansion's ghosts (Funko's other 3 boxes have included variable items before) in the collectors tin. December: Snowflake Mountain. Here is where we will get the "Action Pose" Elsa and Anna to join the other posed Princesses. I think a Flocked Sven Dorbz and a Olaf PSH will complete the box. February: Ever After Castle. "Action Pose" Snow White will be the Pop with Magic Carpet Dorbz Ride featuring Aladdin and Jasmine in their end of film attire. A Gus Gus Mystery Mini will come in the tin. I agree about Tink. She's just not a big enough draw for me. I do wonder if Chip and Dale will be involved in this set somehow. Low-key pissed about Pluto. I haven’t seen a picture of it yet, but I hope it looks ugly so I don’t care about missing it. If they make Figaro an exclusive to the Disney Treasures rip-offsboxes, I’ll probably go berserk. I got my QoH and Maleficent today; thankfully no problems with the seller. I’m glad I went ahead and got Maleficent, because she looks fan-fing-tastic. I’m so happy. October: Haunted Mansion. A new pose for Jack Skellington will be used to market this box. I think this box will feature a second Pop... The Halloween Town Mickey Mouse from Kingdom Hearts to go along with the leaked Goofy and Donald. As for Ever After Castle, that sounds like something where they might include a prince they've never made (unfortunately). Please let it be Prince Charming, Phillip or Flynn--one I don't care about too much--if it's going to be in one of these DT boxes. Chip and Dale is in FYE's computer system as a shared SDCC Exclusive. Ugh, why did it have to be FYE? They don't exist in Canada. There are 3-ways this could go: this is variant (likely flocked) of the Kingdom Hearts set, this is original Chip and Dale in all their naked glory or this is Rescue Rangers Chip and Dale. I could easily see it being any of the three. Rescue Rangers fits right in with the recently released Darkwing Duck Pops and the announced Ducktales and Tail Spin pops. 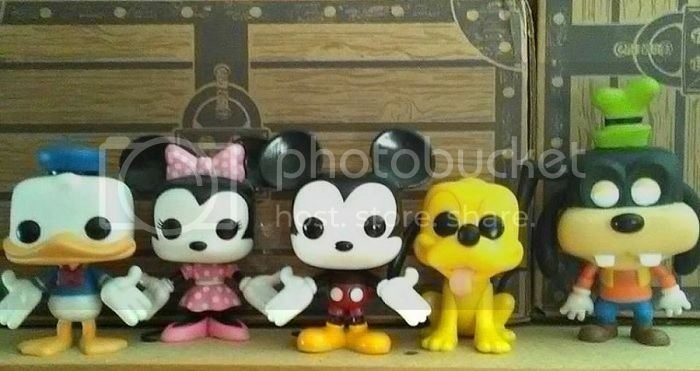 With Pluto coming in the Treasures Box it could be a sign there are other classic characters on the way. There are other Pops on the back of his box that they tried really hard not to show in the reveal video. Flocked KH variants would be the easiest for Funko though. I think they should make Chip n' Dale in both their original and Rescue Rangers forms. I'd rather get them in their latter design, but I know there's plenty who want their classic look. And I still think they'd make a good fit for the next box, ideally in Pint-Size form. I was thinking when they released the KH Chip & Dale that they should go ahead and make regular versions of them, too. I think I'd rather have pops of them the way they look in the shorts rather than their Rescue Rangers outfits, but I don't know. It's probably the classic versions as images of the prototypes for them are out there. The back of the Pluto box is the old Mickey and Minnie Pops nothing new. I got my Moana/Pua this morning and slotted her in with the other Disney Princesses. I have to say she looks MUCH better than the pictures. Something about her hair always looked awful, but thankfully she looks very cute in person. I’m glad I got the one with Pua. With all these little additions, I still think it's such a loss not to get Polyp Triton with the new Ursula. That pack really should've been Ursula (with Trident) + Vanessa + a tiny Polyp Triton. As for the possible Chip & Dale, if I had the choice, they’d have been the Disney Treasures exclusive and Pluto would’ve got wide release. I’m so sad about Pluto. I really wanted him not just to go with the other core characters, but also with the Kingdom Hearts pops. Picked up my Darkwing and Launchpad this past Tuesday at GameStop. They turned out amazing! Darkwing might be in my top 5 favorites now. Would have gotten Gosalyn too, but I need to save for SDCC Exclusives. Apparently a "Red Glitter Jasmine" has shown up in Barnes and Noble’s system. There’s also rumors about Aladdin finally getting a pop. I will definitely be buying both of these if/when they come out. I'd prefer to have a Prince Ali (just in case we never get another Aladdin), but I'd be glad to have him either way. They look so great. I have Launchpad and DW preordered from Canada's version of GameStop, but they have a ship date of June 30th. I have had other preorders ship early though, so I'm hopeful about these. 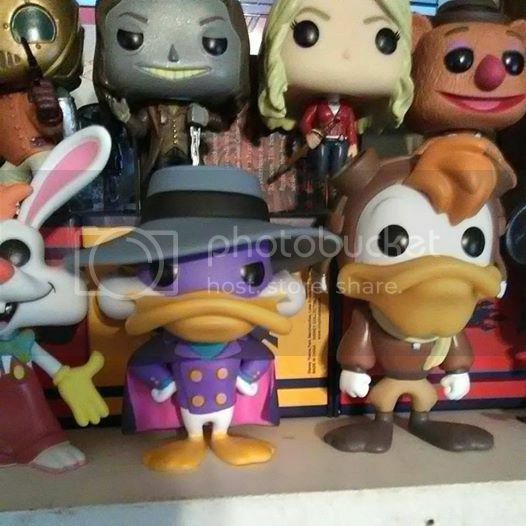 Negaduck is starting to show up on ebay. Hoping I'll be able to find him somewhere during my cross country road trip this summer. I want to see Gosalyn in person before I buy her though. The glams just don't do it for me and I'm really running low on shelf space... bah who am I kidding? I'll probably end up with her too even if she is underwhelming. I just picked up the DW trio at ThinkGeek yesterday, and they look great! I decided to use their buy 3, get 1 free deal to pick up BoJack Horseman as well (not Disney, but hey). And since they're owned by GameStop, I checked, and they will be getting Magica in, so I'll be going there for her. I'm going to check my comic book shops soon for Negaduck. Pluto fits in pretty well with the older releases of his Fab 5 pals. More Barnes and Noble leaks: Another Olaf (with Cats) to go along with the new Olaf thing/whatever it's called and more Kingdom Hearts pops (Sora, Riku, Kairi, Heartless), but also Doc, Bashful, and Dopey. I might consider getting Dopey (especially if he's holding a diamond or a pick), but most likely not. I'm getting all the KH and Aladdin pops they release. The Reddit user who posted the half a photo showing these is also claiming that Sleepy, Sneezy, Happy and a new Grumpy are coming too, as well as a new Snow White and Evil Queen Pop. The Dwarfs are tempting, but I don't know if I have the room. I'll have to see what they look like first.